Thomas Edison, born on February 11, 1847, was one of the major pioneers of the modern electric world. There are several good Kindle books that cover his life and his major contributions to society. For free, you can get a copy of Edison, His Life and Inventions. This book describes Edison’s influence on America in nineteenth and twentieth centuries through his invention of not only the electric light bulb, but the phonograph, batteries and mass communications as a whole. As for the formatting and text, Edison, His Life and Inventions had some glitches. But, there’s nothing to lose if its free right? One reviewer put it well in regards to Edison’s contributions. Edison not only invented the products, but he also invented the industry founded on electricity. 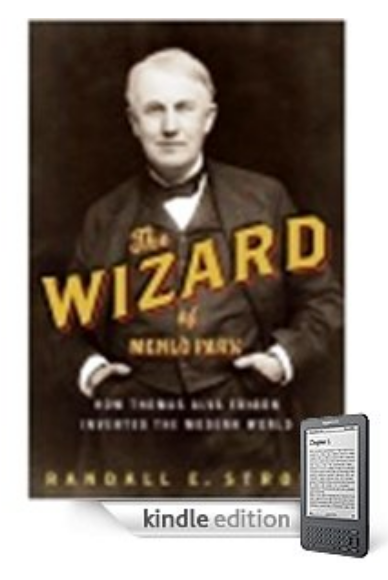 The Wizard of Menlo Park is a refreshing break from the typical biographies of the famous inventor. This book brings out the human side of Edison. Yes, he was very successful and good at creating fascinating new things, but he did not know how to handle the fame and the business side very well. A good lesson from Wizard is that even though you might fail at most things in life, there maybe one thing you are really good at. You can really take off and run with that good talent or invention, like Edison did. One thing I thought was interesting about Wizard was its portrayal of Edison as a celebrity, because the concept of “celebrity” is so different today. Come to think of it, Thomas Edison was a large contributor of making the modern celebrity industry: film, music, etc even possible. 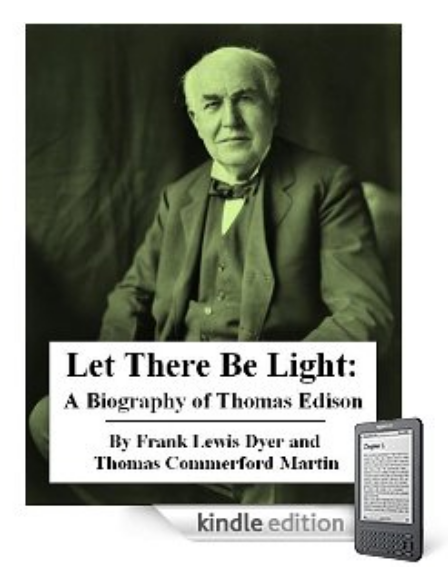 According to Let There Be Light: A Biography of Thomas Edison, the inventor had 1,093 patents in the U.S., as well as many more in France, Germany and England. The phonograph patent was revolutionary because it was the first device to produce and record sounds, but many of his inventions were developed as improvements on past inventions. more Let there Be Light does not have any reviews yet, so it is hard to tell what readers think of this biography. The Kindle book selection Edison is surprisingly small, but overall they have great reviews and are certainly worth checking out. This entry was posted in Good Kindle Books At A Glance and tagged Edison, Frank Lewis Dyer, His Life and Inventions, Let There Be Light, Randall Stoss, The Wizard of Menlo Park, Thomas Commerford Martin, Thomas Edison by holly. Bookmark the permalink. Or you could read about a _real_ inventor and get Wizard: The Life and Times of Nikola Tesla instead. I agree with Joost. Edison was a jerk and only stood in the shadow of Tesla.